28 new sites, in 27 different languages on all devices. 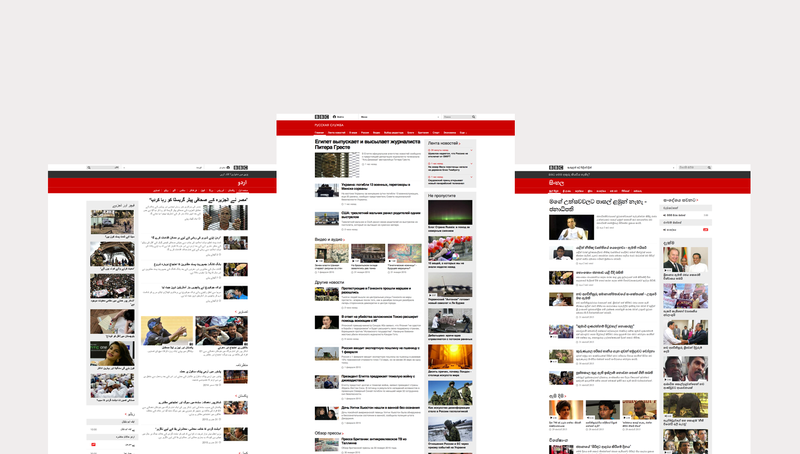 The BBC’s 28 World Service sites reach over 70 million users world wide every month. As device usage rockets across the world - especially in emerging markets - the imperative to make these sites work on every device became more and more urgent. The new sites are fully responsive, built from a core non-js version, progressively enhancing with browser ability and device capability to ensure a quality experience on the full range of devices - from low-end non-js feature phones to top of the line smart phones. Further, we decided to embed scripts on users’ devices when system fonts were deemed too poor, to ensure the best possible reading experience whenever possible. Finally, we designed the elements and modules on the pages to work across all languages and scripts. This approach ensured that we could keep the development costs as far down as possible, by only having to build modules once - but making sure they are stress tested against all the trickeries of designing for different languages; from right to left reading directions to the long descenders of languages like Urdu and the line lengths of Russian and Cyrillic scripts. This responsive module system and it's flexible logic let's us change presentation and position across the sites, moving components around freely letting us meet the individual strategic needs of each service, while keeping a high level of consistency and code efficiency across sites. The Urdu, Russian and Sinhala services.